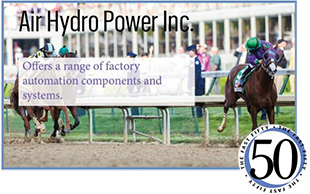 Air Hydro Power is a 2014 Fast 50 Company of Louisville Winner! AHP is excited to be a Fast 50 Company of Louisville Winner for the second year in a row. This award honors the 50 fastest growing independent and privately held companies in Greater Louisville. Do You Know When It’s Time to Change the Oil? Stauff oil condition sensors detect condition of fluids in real time while considering several factors; natural aging of the substance, decomposition of additives and contamination by foreign particles. The sensors enable service and maintenance personnel and production managers to carry out complex and cost-intensive oil changes as and when required by the actual condition of the fluid, and not based on speculation or statistical maintenance schedules. Just call with the serial number of a damaged hose, and it will be ready for you when you come in, no waiting or bringing in your old hose. Parker Tracking System (PTS) is a barcode and RFID tracking system to record and recall hose assembly information designed to reduce vehicle or asset downtime. PTS labels are specifically engineered to withstand harsh chemicals, temperatures, UV exposure and other challenging conditions. This 3 day course, being held at Air Hydro Power’s headquarters in Louisville KY, is designed to familiarize the attendee with the Q Series PLC and GX Works 2 software used to configure and maintain it. Topics include Q base and extension units, extension cables, processors, power supplies, discrete I/O, intelligent function modules, memory allocation and addressing, data registers, timers and counters, entering, editing, and monitoring ladder programs, uploading and downloading programs and more. In many applications, only 24VDC is required, without additional functions. Here, the WAGO ECO power supplies are an economical alternative. Packaged in a flat and solid metal housing, output currents of 2.5A, 5A or 10A, the ECO Power Supplies lower project and operating costs. Cognex’s Checker 4G7C is your answer to fast color inspection! Mitsubishi’s FR-A800 Inverters can help you save money, resources, and time! The A800 Series inverter combines traditional induction and permanent magnet motors into a single solution, providing high performance response and energy-efficient motor control. The A800 frequency controller can support multiple applications, ultimately reducing costs for the end user. and is available in 200, 400, 575 and 690 voltage classes.